Last time I sent one, they actually pointed me to the Bug Report and deemed the problem solved when it's not. So, I let them know that wasn't very cool of them and said as much. You guys know that this will be something that DAZ will probably never fix. They are like ADHA children. Always on to the next thing without really releasing things without bugs of some sort. Just look at the DAZ3D website! :P I'll eat a beet if they ever fix the UV's on the basic body suit. I HATE beets! Try them with sweet ginger syrup, or pickled with ginger... they are actually tolerable like that! Oh i can't stand them pickled... ug!!! The smell is actually worse like that IMO.... my mother used to make beets at our holiday meals and i'd always refuse them.... the few times i HAD to eat them I got sick immediately! YUCK yuck YUCK! Pickled beets and eggs are the best. Frank I think an experience with pickled beets and eggs is how I acquired such a strong dislike of the beets in he first place... that and crimson colored puke. WORST> FOOD>EVER. Are beets the same thing as turnips (or what my husband calls mangelwurzels)? He's from SW England, it's their dialect word. He won't eat them, says they're what you feed cattle with. What's even more strange is he loves to eat snails but picks the mangelwurzels out of a stew and leaves them. Hahahaha..... kinda like me with mushrooms. Can't stand them and if the food is laden with them and that's all there is to eat I spend more time fishing those slimy things out of what ever it is..... YUK! I think basic suit is offered to customize by user easy,so need clean uv map,,, and grouping. sift and + key, then select front part only. after adjust UV map,, then export is as obj. In ds , on surface option, load UV map then select the saved obj. then I can save the UV set as vnedor name. Now I load the basic suti, it has two UV set,,,.. I am sorry ^^; , just approve and send bug report of yours ! The problem with making your own UVs is that anything you make will only work with that UV set and not with anybody else's UV set. So it really needs an official and standard set that everybody can use. That way any textures are guarenteed to work. I really wish they had sold the normal bodysuit as a different item from the supersuit. That way they'd have to take more notice and there'd be no confusion as to which one was meant. I agree. With an official fix release, we can develop content without worrying who has what fix or compatability issues. I've had a reply to my ticket. Poor Jared is going to raise this with QA yet again. He said he'd fix it himself if he was good at making UV maps. I have added a note that several people are annoyed at the way this has been forgotten. At least he is trying to get things moving. Some of us only bought the "supersuit" to get the basic one. I don't have any interest in the sort of things the supersuit was designed for but have many uses for an ordinary bodysuit. Yea, the basic suit is all I really need and I really like the shaders so those made my purchase worth it. I've used the main Supersuit like 2 times and never saved any of the scene files for what I was able to accomplish. Just too much going on there. I was just using the Supersuit and basic suit last night. I would also like to add a logo to the chest, just as heroes always seem to have. But I don't see how to do that, if the Supersuit only uses grouping and shaders. Can someone point me in the direction of a tutorial or something on this? I did have a good time discovering that I could layer the basic suit OVER the Supersuit, and then play with having parts of the Supersuit jut out of it. I like doing superheroes, being a comic book greek from the age of 9. So that's 43 years now. Jeeeeze. Gettin' old. 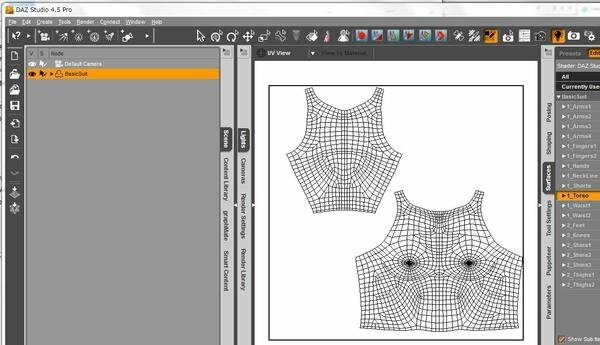 Have you considered using a UVMapper UVS file to distribute? I dunno if it would work, but it might. You can't do this as the UV for back and front are on top of each other. This is why we want the UV's redone. I didn't buy the supersuit for the basic one like you may have, but it was definately a pleasant surprise when I found out it was included! It's become very valuable to me. I recently bought the bundle when it was on sale. I have uses for both suits, but I like the fact that there is a basic one a lot, because that to me seems more like a comic book costume look, where the SuperSuit looks more like a movie costume style such as the "orange peel" kind of look from the Man of Steel movie. Movie style is okay and all, but I really like the fact that I can do a smoother comic book style on the basic suit. Also, as someone mentioned above, you can see some of the morph areas on the SuperSuit even if the morph values are zero. The V4 Bodysuit had that problem, where even if you used the hide seam morph or whatever it was called, you could still see some of the seams. Here are some UV Maps for the MAIN Supersuit. Won't work for the Basic Supersuit, though. Just open them in your 2D image editing program of choice and texture away. Need anymore help, throw me a PM. Good to hear that Jared is going to be talking to QA again. Hopefully, they will do something about it this time. I, for one, will not let this go until someone at DAZ does something about this. If the UV's were fixed on the Basic Supersuit, that would be the better option.